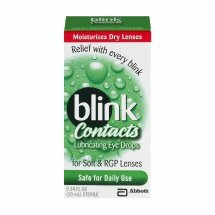 Blink Contacts® Lubricating Eye Drops for Soft & RGP Lenses. Contents: Blink Contacts®: Lubricating eye drops is a sterile, buffered, isotonic, preserved solution. Lubricating Eye Drops Is A Sterile, Buffered, Isotonic, Preserved Solution. This Aqueous Formulation Includes Purified Water, Sodium Hyaluronate, Sodium Chloride, Potassium Chloride, Calcium Chloride, Magnesium Chloride, Boric Acid And Is Preserved With The Ocupure Preservative (Stabilized Oxychloro Complex 0.005%).